With Christmas on the way, and because regular old decorations just don’t cut the mustard, we’ve rounded up a collection of incredible and impressive Christmas trees to inspire and delight tech-lovers. From the high-tech to low-tech, there’s plenty here to wow geeks and gadget-lovers. Possibly the most impressive Christmas tree on this list dates back to 2007, when downtown Madrid hoisted a Pac-Man display in the shape of an evergreen centrepiece. This incredible Christmas tree featured a fully animated version of Pac-Man rendered using thousands of LEDs. Also in December 2007, the base of the Yurakucho Marion building in Tokyo, Japan, was decked out with a 3D-laser Christmas tree. A handy little number for when it comes to the January clean-up. In Grand Central Station in New York City, Sharp in 2008 erected a 26-foot tree made out of 43 Aquos LCD televisions. Each one of the TVs, ranging in size from 19 to 52 inches, was up for grabs as part of a Christmas giveaway. This 7-foot tall Tesla coil Christmas tree built in 2009 was actually refined by Aussie high-voltage experimenter ‘Dr Electric’ (aka, Peter Terren) to include more colour and even a star on top, but there’s something extra magical about this wild and erratic early version. If you think the giant Tesla coil was scary, how about the Godzilla creation that terrorised shoppers in the Aqua City Odaiba shopping mall in Tokyo for Christmas 2011? It even breathed smoke! A team of GE engineers and scientists built this Christmas tree from flexible OLED panels to light up GE’s Global Research Centre headquarters in New York in 2008. Apparently, this very Portal Christmas tree took the duration of two and a half Die Hards to assemble. This shiny Christmas tree was made using 70 old SCSI hard drives between 9GB and 18GB in size. Talk about upcycling! Another fine use of spare computer parts, this RAM-shackle creation comes from the University of the Sciences in Philadelphia. Got a Dalek lurking about the house? They make great Christmas tree substitutes. Bonus points if you can get it to say, ‘Cel-e-brate’. Not every tech geek has room for a Dalek or Godzilla Christmas tree, so they make dinky web-controlled ones using a circuit board. If you want to build one of your own, you’ll need to be able to read the instructions in German. 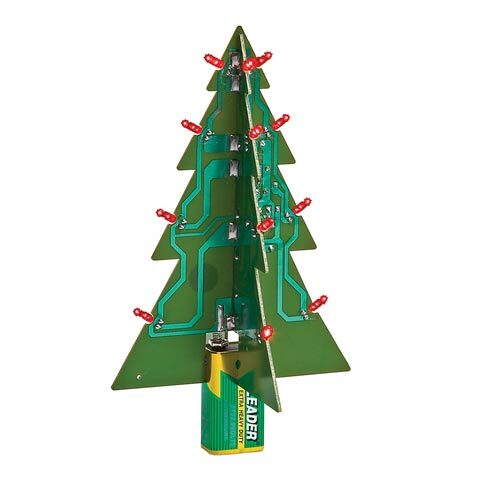 Easier to assemble is the LED motherboard Christmas tree, that comes ready-made – just connect it to a 9-volt battery. Another way you can build your own Christmas tree is with Lego bricks. Photographer and Lego-builder Chris McVeigh has published a complete guide to his pretty little creation online, which is a mere drop in the ocean compared to the ultimate Lego Christmas tree, which ‘master builder’ Duncan Titchmarsh built for St Pancras Station in London for Christmas 2011. Titchmarsh of Bright Bricks is the UK’s only certified Lego professional and his 12.2-metre tall Christmas creation was made with 600,000 Lego bricks and 172 branches, and decorated with 1,200 Lego baubles students from local primary schools had built. And if all else fails, including the power, there’s always Post-its – and those at Irish design studio Detail are clearly the masters of this technique.